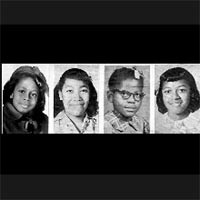 It was 48 years years ago today that the four Birmingham, Alabama girls, Addie Mae Collins, Denise McNair, Carole Robertson and Cynthia Wesley, lost their lives during the bombing of the Sixteenth Street Baptist Church. Today an official marker was rededicated there in their names. Singer Nina Simone wrote “Mississippi Goddam” in immediate response to her anger following the event, just three months after the murder of Medgar Evers in Jackson, Mississippi. “I shut myself up in a room and that song happened,” she said. From that moment forward, Simone was committed to writing and performing material that would jolt people awake or into action. The song remains one of her most enduring works.